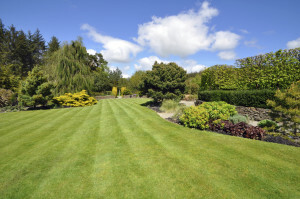 Are you looking for way to enhance your lawn? One way to do that is by hiring Phipps Landscape. We will offer you variety of services. One of them is hydroseeding which is a very popular choice for our clients. We offer the most competitive rates in the area, and people prefer our services because they know that they will have the results they expect. Every expert on our team has the necessary knowledge, skills and qualifications to provide you with timely and effective services. With us at your side, you will have nothing to worry about, except enjoying a healthy, beautiful and green lawn. The area should be prepared. What that means is that our experts will first test the soil. Grading is of vital importance. There are two types: rough grading and final grading. Our experts know what amendments are needed to get a proper soil for grass growth. Then, a rototiller will be used to relieve compaction before hydroseeding, which is done for best results. It is also important to get the spraying done before the prime grass growing season begins. Our professionals can easily do these four steps because they have done them so many times. Although, you might be tempted to do that by yourself, we assure you that it is a lot harder to achieve such project by yourself than to have experts do all of that work for you. If you want to have the best out of such project, make sure you give Phipps Landscape a call at (603) 742-3500! You will be glad you did.